Swedish Country Decorating: Get The Look! Swedish country decorating is all about space, clean lines, and a light touch. simplicity & comfort | multiplying the light | celebrating nature | surface decoration. The following decorating tips for Swedish country interiors are from my Swedish designer friend, Ida Jönsson. We met at Chelsea College in London and shared many long days in the design studio, as well as many deep conversations over steaming mugs of black coffee. The 18th-century "Gustavian" style is a Swedish interpretation of European neo-classical decor. It goes back to King Gustav III's "French connection": On a visit to Louis XVI's court in Versailles in 1771, the future Swedish monarch was so impressed with his French counterpart's cutting-edge interiors that he decided to introduce the style to Sweden. Neoclassicism was readily adopted into Swedish architecture and interior design, but in a simplified, no-frills way. Pared down, airy and calmly elegant, the light-filled Gustavian style spread from the town houses of the well-to-do to rural Swedish country homes. Pale blues, greens and grays are typical decorating colors of the Gustavian style. What King Gustav III did for Swedish interior design in the 18th and 19th centuries, Carl & Karin Larsson did for Swedish country decorating in the 20th ... and it seems their legacy is holding up beautifully in the 21st century as well. The Larssons' timber cottage in the Dalarna countryside has inspired and influenced Swedish decor since the late 1800s. It combines Swedish folk art with elements of the Arts & Crafts movement. A lot has been written about the Larssons' innovative Scandinavian home design; check out the book (left) for excellent study material! 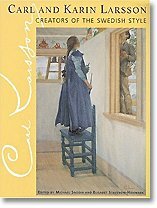 When Carl & Karin first met (at a Scandinavian artists' colony near Paris), they were both accomplished painters. The embroidered bed curtains were Karin's creation; see the original here and one of her woven curtain designs, "kärlekens ros" (Love's Rose) here. 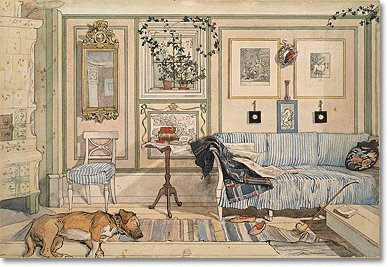 In 1898, Carl Larsson published a book of watercolors celebrating his home and family: Ett Hem (A Home). The luminous, colorful images of Swedish country living struck a nerve with readers all over the world, and Lilla Hyttnäs became one of the most famous artists' homes ever. Generally, people prefer chalky, powdery tints (in the tradition of old water-based distempers and limewashes) to bright, saturated colors. Swedish country homes contain a lot of blond wood (birch, white pine, beech, alder). It is used for furniture, floors and walls, and either left natural, bleached, or painted in pale colors. Simplicity is the order of the day in Swedish country decorating (actually, in all Swedish homes, from farmhouse to city pad - and in Norway as well). Spaces are kept open and light, materials are genuine and furnishings are low-maintenance. Furniture has mostly straight lines in Swedish country decorating, sometimes with gently curved detail and occasionally with carved accents. for an authentic Swedish interior design look. The winters are so long and dark in Sweden that people want to bring light and warmth into their homes as much as possible. For this reason, fireplaces, stoves and candles are important features in Swedish country decorating, as well as chandeliers, wall sconces and table lamps. Windows usually have fine white muslin curtains (if any), and mirrors (sometimes with candleholders attached to them) reflect as much light as possible back into the room. Table settings, too, reflect the need for a light touch - Swedish country tables are laid with glass, silver, and light (plain or floral) china in pale colors for an unassumingly beautiful look. Once spring arrives, the doors are thrown open, everyone is outside in the sunshine as much as possible, and nature is brought into the house. Karin Larsson's hand-woven and embroidered textiles set an enduring trend in Swedish country decorating, and to this day handmade accessories & furnishings from natural materials (wood, glass, textiles) are an important element in Swedish interior design. Plain, textured fabrics, as well as floral patterns, stripes and checks, are used for soft furnishings in Swedish interior design. Find rustic decorating ideas for a country style Living Room, choose the perfect country style Sofa or get creative with your country Bedroom! 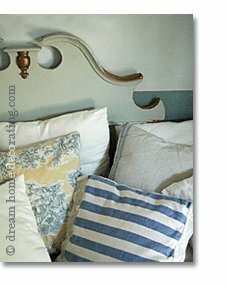 Check out country cottage decorating ideas from Switzerland, France/Provence, and Italy/Tuscany. Learn about neutral color palettes - they're great for Swedish country decorating. Understand what makes neutral color schemes look their best, and what happens when you inject 'real' color into neutral color palettes. It's FREE!! Return from Swedish Country Decorating to Country Decorating Ideas. Return from Swedish Country Decorating to the Dream Home Decorating homepage.